Yesterday, Fialonia and I made a fennel/quinoa/chickpea casserole that looked and smelled fantastic but was lacking in the flavour department. I haven’t really figured out how to jazz it up yet so I’m not going to post the recipe. And because of this, I have nothing to say this morning. But I feel as though I should say…something. So here it is. You may recognize the cute little donut character above from the Extra chewing gum ads on tv. Isn’t he the sweetest? But here’s the thing. I can’t watch these ads without feeling awful at the end. I want the donut, not the gum, to win. Why can’t the donut go to the party?? Who hates the smell of donuts?? Coffee, I’ll give you. And that little onion on the commercial is a jerk, who keeps forgetting that donut exists. 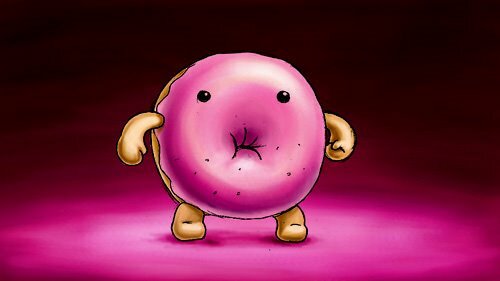 But donut!? He can barely walk and he’s trying so hard. Plus everything freaks him out. Let him go to the party!! Everytime the commercial ends, I’m sad. Sad for donut and sad for a world that doesn’t like the smell of donuts.